Mention blue and white and we tend to think of summer – blue sky, white puffy or wispy clouds, lazy afternoons on the porch, ice tea and lemonade in hand; ocean frosted with cresting waves, warm sand at foot, the call of seabirds and children squealing with delight. Blue and white has been the quintessential color scheme for waterfront homes for a very long time. Surveys, again and again, show blue to be the most popular color, across gender and race. One of the most famous decorating schemes in blue and white, now often copied or imitated, was by Billy Baldwin for a villa in Italy. Baldwin, a master decorator of understated and simple elegance, used sky blue cotton upholstery over a deeper blue and white rug, a mix of blue and white small scale geometric pillows, blue and white pottery, white flowers and greenery against off white walls and filmy white curtains. The result is both serene and fresh and need not be limited to ocean, lake or river locations. 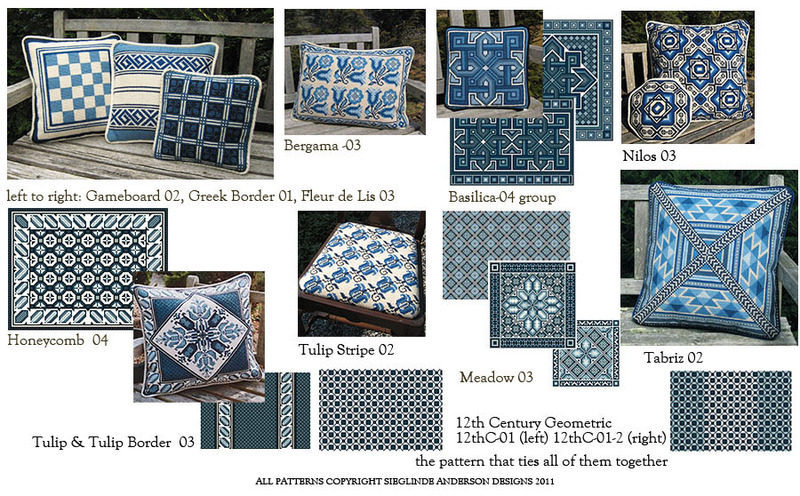 Most of the patterns shown above are available in a variety of sizes: lumbar or back pillows, squares and also rugs. Please visit the website to see all possibilities. 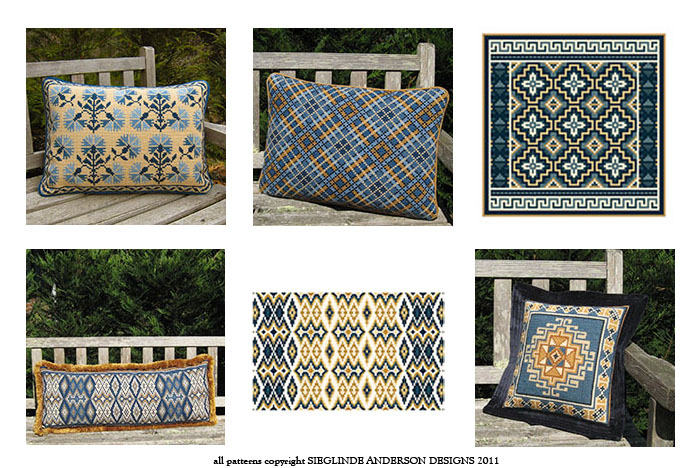 The Tulip Stripe shown as upholstery on a chair in the above photo is also available as a pillow, and the 12th Century Geometric pillow is also available as upholstery. Honeycomb, Nilos, Tabriz and 12th Century Geometric are available as small rugs. A variety of schemes can be pulled together from the patterns shown. 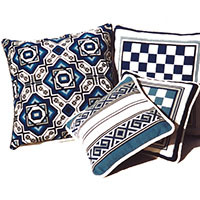 For example, one could use the two versions of the 12th Century Geometric for pillows, the Tulip Stripe on a chair or bench, and add solid pale or dark blue pillows to supplement the patterns. Another example might be Tulip and Honeycomb for pillows with the Tulip Border used for upholstery on a chair or stool. Trust your imagination to come up with the right combination for your interior – whether living room, bedroom or study. Waves, sun and cerulean skies….ocean hues, from foamy whitewater to deep teal…evoke memories of the beach and summertime. From pale icy blues, pale to dark gray blues, pale aqua to turquoise, deep teals – both green and blue – ocean hues change continuously depending on sunlight reflecting off water early or late in the day, on whether the water is smooth or choppy, how waves break – big or small, and, of course, location – Caribbean or cool northern shores. Some of us love walking along the water when it’s calm, others of us enjoy stormy seas. Which are you? These colors can be both restful and serene or exciting and mysterious. Yet a different mood is created by adding colors of a sunset reflecting golden on the water surface, or adding sand colors as seen through waves lapping at water’s edge. Whether pale or dark – silver, tan, beige, brown or pewter – in addition to blues and ocean hues adds a certain level of warmth. Below are some suggestions for more exploration. 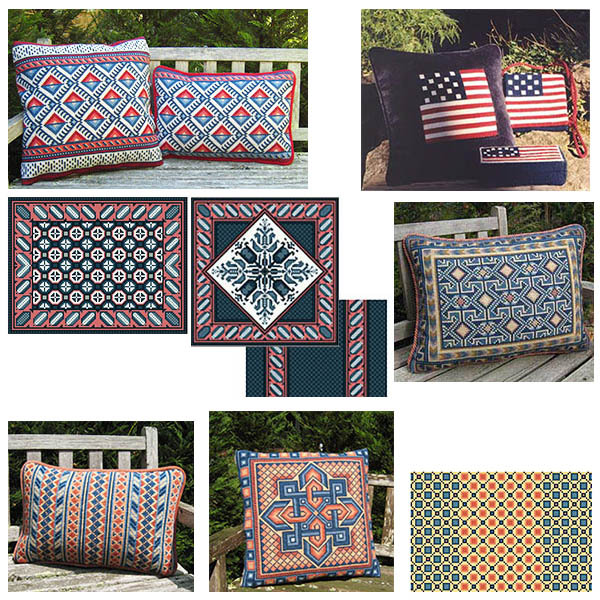 Most of these are available in many different sizes ranging from small accent pillows, to back pillows, to large and small squares and long rectangular pillows as well as some rugs. Sometimes colors are arranged in a different way on sizes other than shown above. For example, Soumak is available in 4 sizes and the background color changes in each. In cooler climates or to use blues year-round in all climates, we can add more colors such as coral, lemon yellow, or browns and dark beiges to create warmth during the colder month without changing the entire color scheme. Yellow combines beautifully with so many blues. Blue and yellow is an enduring color scheme and can be found in tiles, dinner ware, bowls, vases, fabrics, decorative plates and jewelry in countries all around the Mediterranean, and from there across the Atlantic in Central and South America. In Portugal, entire buildings are covered with blue and yellow tiles, inside and outside. From pale buttery yellows to deep egg yolk yellow, sunny colors lift the spirit and bring instant cheerfulness. Combined with blue – whether indigo or turquoise – creates a combination both cool and warm. In interiors, this classic combination is often seen in kitchens but has historically been used successfully in living rooms and bedrooms. One of the most famous yellow rooms was that of Nancy Lancaster, an American living in England and part of one of the most illustrative decorating teams with John Fowler. Recently I came across a photo in a magazine that showed a living room with pale yellow walls and a grayed blue and white carpet, blue and white plates on the walls, strong sunshine yellow slip covers on chairs, solid blue and blue & white throw pillows. Stunning! 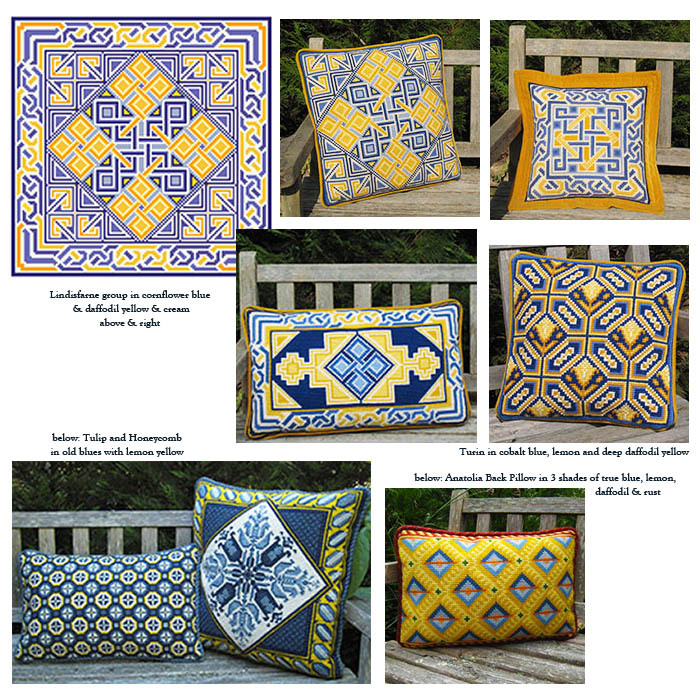 The starting point for a yellow and blue scheme can be a piece of pottery, tile, painting or stitched pillow. Perhaps you have a bowl of Italian majolica in turquoise blue and pale lemony yellow, or a true blue and daffodil or buttercup yellow painted plate to use as your starting point for a summer scheme. 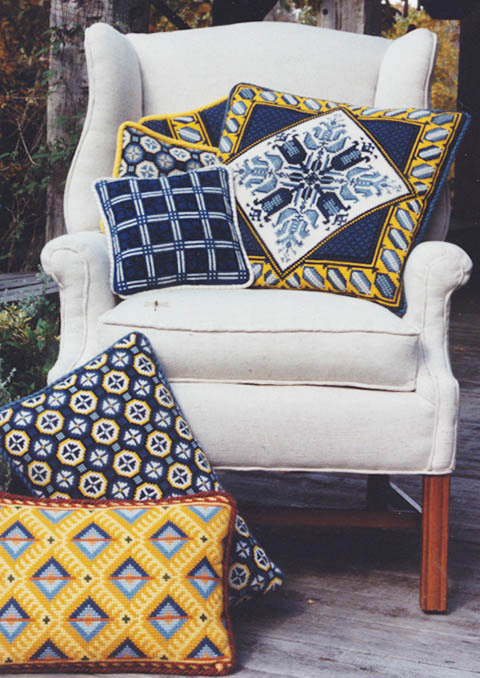 Whatever your accumulated treasures that are your reminders of a life lived, at cross-point™ we offer custom colors so we can adapt any one of our patterns to your particular shades of blue and yellow. Both Honeycomb and Anatolia include small rug kits. 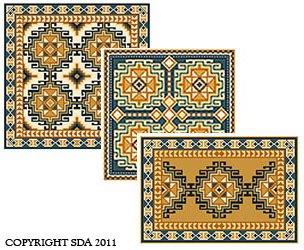 These rugs would be wonderful used across a large ottoman, on a chest, or even across the foot end of a bed. at far right: Pattern 12th Century Geometric #03 colors which blend with both Basilica 07 pillows & rug, and Oahu 04 in all 3 sizes. However you create your private ambiance, however you arrange your summer colors to reflect your own taste and remembrances of summertime, if you include blue it will be easiest to have a successful scheme if you will stick with one color hue and use it in different values: palest blue, medium blue, dark blue.